With many uses and benefits our veterinarian and farming products will make farming easy with less stress for both user and animal! Branding equipment that is more effective and leaves a neat permanent mark. One operator required to finish any job, quickly and easily! The home of Excellent, Superior and Elite Tuli cows. Easy care and hardy animals with good mother to calf wean ratio. Hardy, veld-adapted animals. 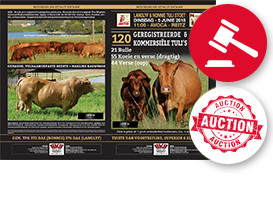 Get top genetics at this year’s sale. GEHARDE, VELDAANGEPASTE BEESTE op aanbod by ons veiling! Moet dit nie misloop nie!